Learn how to speak Mandarin - Wow! Shao Mai is really delicious! Chinese Video Courses >> Beginner Chinese Series 4 >> Wow! Shao Mai is really delicious! Wow! Shao Mai is really delicious! Introduction: Improve your Mandarin speaking ability by using the popular structure to express something is enjoyable or disagreeable. n. shāomài a kind of Beijing local snack，it looks like a meat-filled pouch. n. suānméitāng a kind of traditional drink in Beijing, it’s made of plums. The pattern “好+V/难+V” is used as an adjective phrase within a sentence. “好+V/难+V”can be used as an adjective phrase in a sentence to express a preference for an image, sound, melody, taste, feeling and so on. For example: "好看"，"难看"，"好听", "难听","好吃","难吃". But, you can only say "好玩儿", as "难玩儿" doesn't make sense. Situated inside the Dongzhi Gate, Gui Street is a renowned culinary street in Beijing. Not only can you taste all kinds of authentic Beijing snacks, but you can also find special delicacies from other parts of China. There are a number of embassies located around Gui Street, making it a popular place to visit for overseas tourists, as well as foreigners working in Beijing. 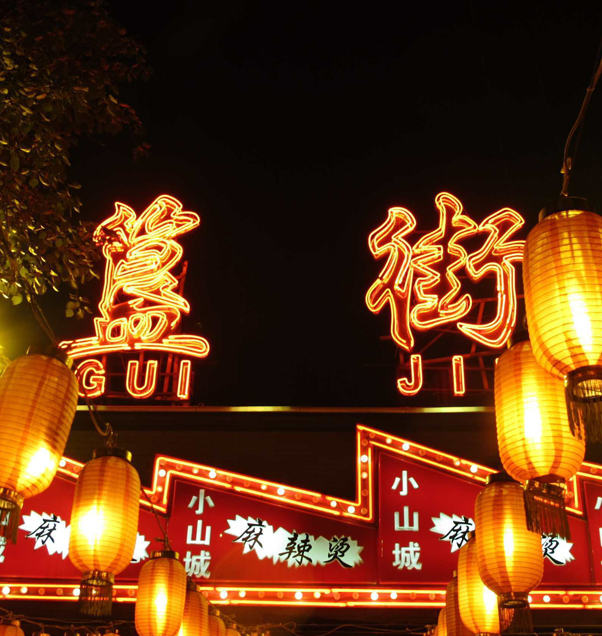 Gui Street is not just a culinary street; it also represents Beijing’s nightlife. When night falls, Gui Street becomes bright and noisy, welcoming friends from all over the world. So, after a long day's travel, it's a good idea to take a walk along Gui Street, tasting delicacies and happily chatting about all manner of subjects. Do you know the renowned Gui Street in Beijing? In this lesson, let’s follow Li Qiang and Anna to try some delicious food on this famous street! Our native Mandarin-speaking Chinese teachers will teach you how to express your likes or dislikes with the common phrases “好+v./难+v.”. Some other useful words are also included such as delicious. Your lessons are interesting, well explained and funny at the same time, congratulations.